Where’s the Love for the Sixers? It’s a new age for the Philadelphia 76ers. Best start in nine years. Only one loss at home. First place in the Atlantic Division. Third best win percentage in the Eastern Conference and fifth best in the NBA. All these are accolades deserving for one of the hottest teams in the NBA. But tickets are selling on par with the worst team in the division. 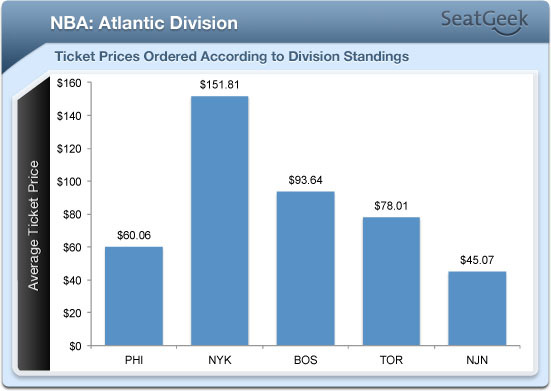 The New York Knicks far and away have the most expensive average basketball ticket in the Atlantic Division. No doubt they made some flashy trades a couple of years in picking up Carmelo Anthony and Amare Stoudamire and Tyson Chandler in the off season. The Boston Celtics‘ and Toronto Raptors‘ fan base continues to bolster their average ticket price which are 55.01% and 29.89% more expensive, respectively. The New Jersey Brooklyn Nets low ticket price is justified by their dismal play as well as their looming relocation. But for a city with an ardent fan base and a love of scrappy, blue-collar, underdog players, it’s surprising to see that the fans aren’t flocking to the Wells Fargo Center to cheer on the Sixers. In light of a forgettable season for the Eagles, a shortened playoff run for the Phillies and an injury plagued season for the Flyers, the sports fans in the City of Brotherly Love aren’t filling Sixers’ seats. 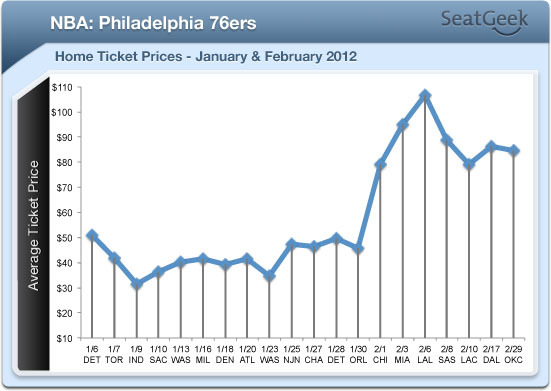 Philadelphia fans should really take an opportunity to invest in the Sixers. With a forward thinking CEO who has a flair for the unconventional, he’s a great fit for the city. Bringing Doug Collins veteran wisdom to teach the young team has paid immediate dividends in a year. And with the solid teamwork the Sixers have demonstrated on the young season, fans should flock to the Wells Fargo Arena to support the Sixers, not just to see another hot-shot team with a big duo or trio of NBA All-Stars. The way things are going for the Sixers, expect them to field a starting five stock full of All-Star talent.